South Shore Summer Breeze Twin Bookcase Headboard in Blue (included quantity: 1) For a stylish, updated version of cottage country, the Summer Breeze Headboard is an ideal choice when decorating a child's or teen's room. The Summer Breeze Blueberry Headboard is simple in design, featuring an arched silhouette, decorative molding and a set of convenient shelves. 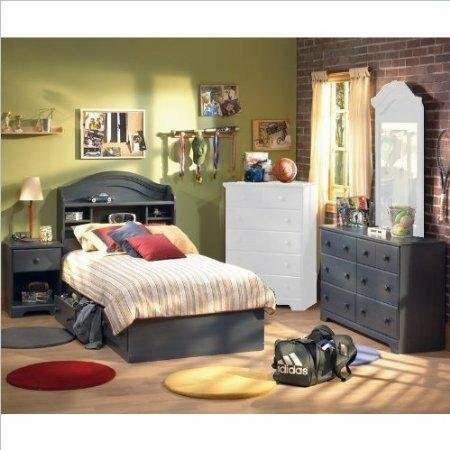 Features: Headboard only; bed not included Headboard features solid particleboard construction ; Constructed of CARB compliant materials ; Headboard has an Antique Blue finish ; Headboard features two small shelves and one large shelf ; Ready to assemble ; Perfect for boys and girls . Specifications: Overall dimensions: 48"H x 41"W x 10"D; Weight: 46 lbs. . South Shore Summer Breeze Twin Captain's Bed Frame Only in Antique Blue Finish (included quantity: 1) For a stylish, updated version of cottage country, the Summer Breeze collection is an ideal choice when decorating a child's or teen's room. The Summer Breeze Mates Bed Box is simple in design, featuring three generous-sized drawers for convenient under-bed storage. Features: Antique Blue Finish Playful Country Cottage style Constructed of Particleboard With Laminate Finish Constructed of CARB compliant materials Five Year Manufacturer's Limited Warranty Has Three Pull-Out Drawers Perfect for boys and girls Mattress and linens not included Specifications: Overall Product Dimensions: 16"H x 76"W x 41"D Drawer Dimensions: 22.5" W x 17.25" D x 4.25" H Weight: 126 lbs South Shore Summer Breeze Antique Blue Double Dresser (included quantity: 1) Specifications: Overall Product Dimensions: 31.25" H x 52" W x 19.5" D Product Weight: 118 lbs Drawer Dimensions: 4.38" H x 22.625" W x 13.63" D South Shore Summer Breeze Nightstand in Antique Blue (included quantity: 1) Specifications: Overall Product Dimensions: 25"